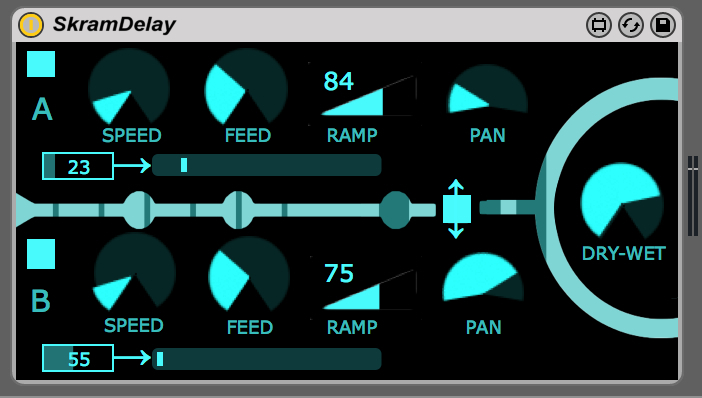 Skram Delay lets you dial-in various flavours of delay randomness. From subtle changes such as slap-back or cardboard echoes to complete sonic chaos – Skram Delay’s speciality are ‘instant glitch’ sounds. With the link button activated, each channel change will happen on both channels with the exception that the pan changes are reversed – if you move one channel to the left in link mode, the other channel will move to the right side of the stereo spectrum. 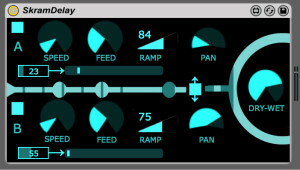 The ‘Ramp’ labelled parameter will interpolate between the randomised delay times to achieve a unique glitch effect. The Feed parameter (feedback) will control the amount of audio which is routed back into the delay line while the Speed parameter defines the speed of the ‘randomness’.